Another nice kite-move of Madli: Front roll transition... ok she's already through! The team from Funboard Center Boracay wishes you a great 2012 full of highlights, happyness, power & relaxing time. Read more about Happy New Year 2012! You know Nigel from last november, when he got his first kite-lessons at White Beach. During his second visit in January to Boracy he finally became an independent kitesurfer. Congrates! To all who don’t know us: just grap a tricycle on the main road and turn into the Bulabog road. That one will bring you to the beach, where you turn left. 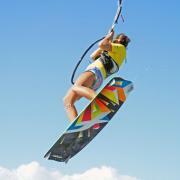 After further 300m you will find the Funboard Center Boracay.